Below is the back cover blurb, but yeah, it’s pretty wild how many people have asked me for a Riot book over the years. So much so that I included a few fan stories in here to pay tribute to the people’s band status of these guys. And you’ll like the price of it, I hope. Remember, I am signing, packing these up and mailing from Canada. Orders will be signed from me to you, so please specify if it’s a present for someone else. Glad to sign as a present for your fave old school metal buddy! These are the pioneering, superlative heavy metal records that represent the classic first decade of Brooklyn’s Riot’s, before the band would break up, eventually storming back with Thundersteel and The Privilege of Power, existing to this day as Riot V after the shocking death from Crohn’s disease of guitarist and leader Mark Reale. 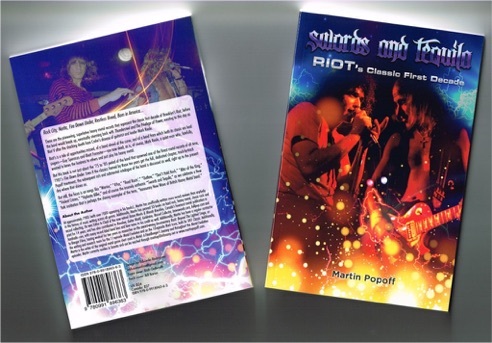 Riot’s is a tale of opportunities missed, of a band ahead of the curve, and of a band from which both its classic era lead singers—Guy Speranza and Rhett Forrester—are now dead, as is, of course, Mark Reale, a quiet man who, fatefully, wanted to leave the business to others and just play his heavy metal. 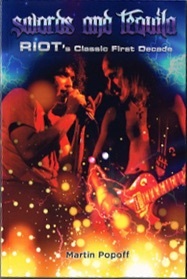 But this book is not just about the ’75 to ’85 period of the band that spawned one of the finest metal records of all time, 1981’s Fire Down Under. Even if the classics framed by those ten years get the full, dedicated chapter, track-by-track Popoff treatment, the subsequent rich and substantial catalogue of the band is discussed as well, right up to the present day where Riot shines on. But still, the focus is on songs like “Warrior,” “49er,” “Road Racin’,” “Outlaw,” “Don’t Hold Back,” “Altar of the King,” “Violent Crimes,” “Vigilante Killer,” and of course the insanely anthemic “Swords and Tequila,” as we celebrate a New York institution that is perhaps the shining exemplar of the term, “honourary New Wave of British Heavy Metal” band.